Friday lunchtime and nine cars pulled up at our usual meeting spot, Boreham Services, and this was the start of the Essex double header! 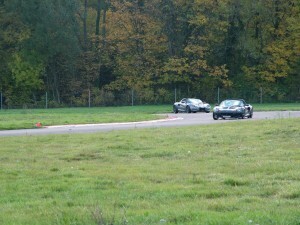 A weekend away with like minded enthusiasts taking in a pair of French track days with Lotus-on-Track. We drove down to Maidstone services to collect another three cars and then all twelve of us headed for the Euro Tunnel. Once in France we had a leisurely cruise to our hotel in Saint Quentin. 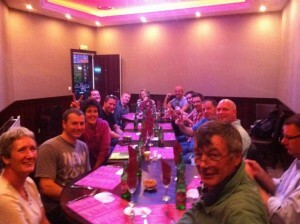 Cars parked up and it was straight to the Lotus Bleu where we had a nice Chinese buffet and a lot of beer! Bigsteve explained to the waiter that he owned a blue Lotus and wanted the waiters t-shirt, but had to settle for a complimentary Saki instead. The following morning we all met for breakfast and then headed for Clastres. As we arrived we were presented with a perfectly dry track. All signed on and briefed we headed out for the sighting laps. There were a few nervous faces as for some members this was their very first introduction to track driving. 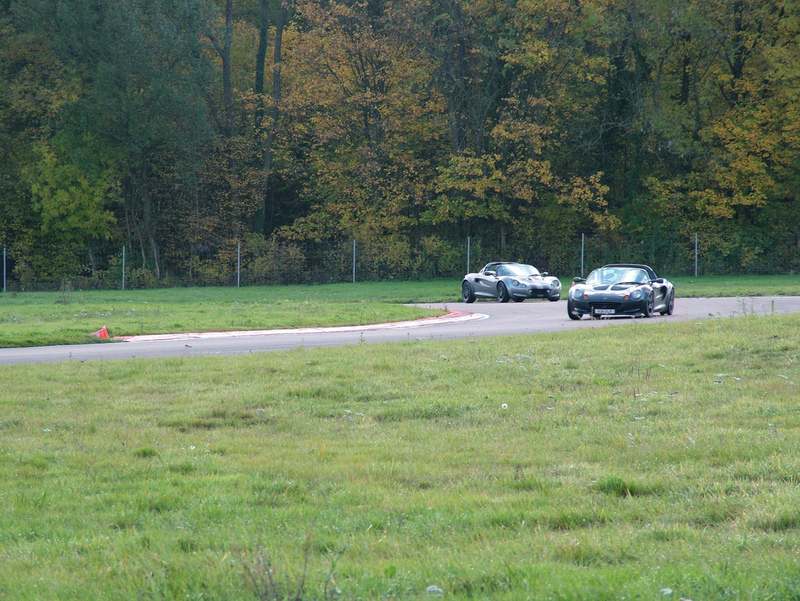 As soon as they got out on track the nerves quickly vanished and the day flew past very quickly indeed. I spent so much time in everyone else’s cars I only managed one session in my own! This problem was resolved by Loopylea taking the Exige out to stretch its legs whilst I listened to the screaming supercharger from the pits! 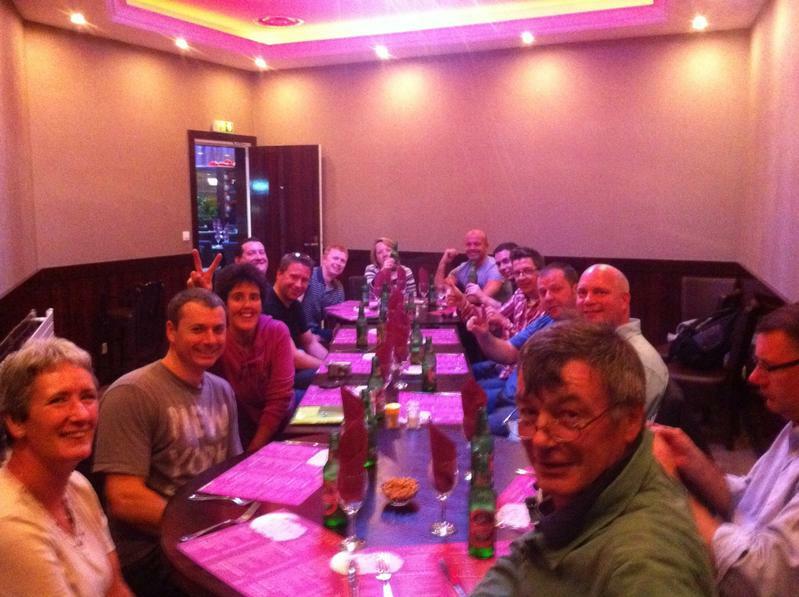 Track day over and we headed for our second hotel in Soissons. We ate in the Camponile next door and had a few more beers. They ran out of some of the bottled beers so we took this as a sign to call it a night! Onto the following morning and we all headed for Ecuyers. The drive was a bit of a nightmare as the main road to the circuit was closed and we had to try and re-programme our SatNavs. We finally arrived about 25 minutes later than planned and got signed on, briefed and started some sighting laps. The track was very damp and greasy and Karelin tested to see if the grass was faster than the tarmac but found it wasn’t! Once the sighting laps were finished Chimjunkie and myself headed out for a few flying laps which proved to be very entertaining! By mid morning the track was drying out in places and people were learning the circuit so the pace started to really pick up. It was hard to believe there were a lot of novices as the pace was good and the driving standards were impeccable. Lunchtime quickly came and everyone went out for petrol and food and we had a very relaxing two hour lunch. After lunch there was just enough time for another couple of very fast sessions and then we all headed for home. All in all it was a fantastic weekend with great company, great cars and great tracks! A big thank you to Paul and all the staff at Lotus-on-Track for a very well run weekend. 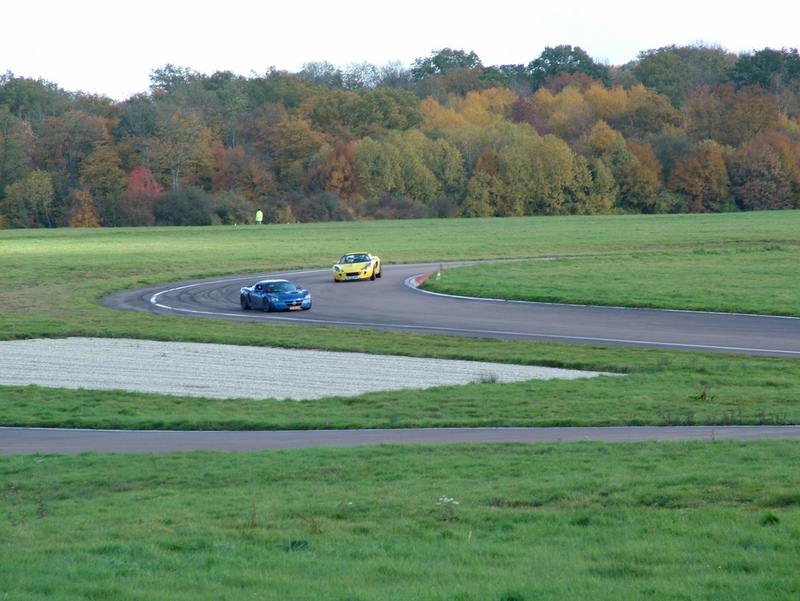 You can find more photographs and videos from this event in the forum thread “Essex on Track – 29/30th October – France”.